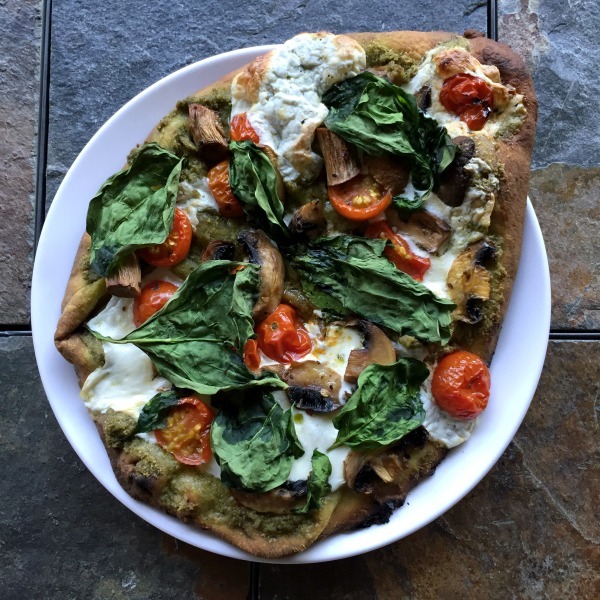 Naan Pesto Pizza with Roasted Tomatoes, Mushrooms, and Spinach! I cooked dinner early tonight because the savage beasts — I’m sorry, scratch that; I meant to say: My darling children — were s-t-a-r-v-i-n-g. So, that allows a little more time to share this Meatless Monday recipe on a Monday this week. How novel! Looking for more vegetarian recipes? Take a few minutes to browse through the Meatless Monday category for additional dinner ideas. 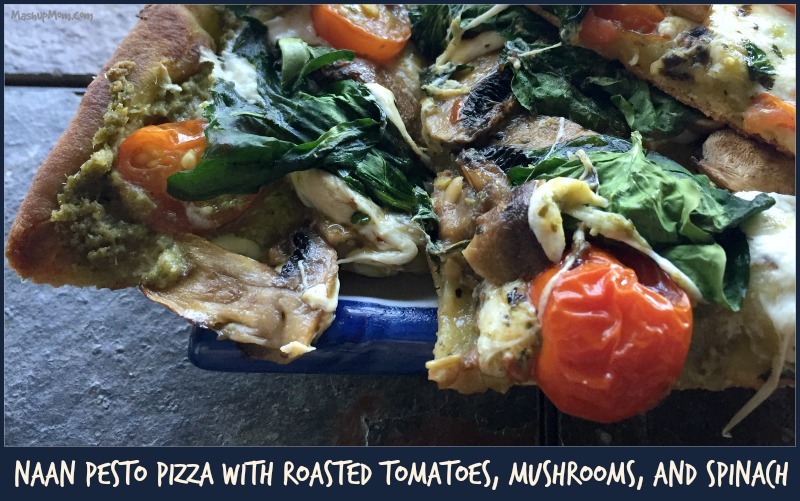 Preheat oven to 400 degrees and arrange tomatoes and mushrooms in a single layer on a rimmed baking sheet. Drizzle veggies with olive oil and season with sea salt, crushed red pepper, and basil, then toss lightly to coat. Roast at 400 degrees for 15 minutes, then remove from oven. Place naan on two baking sheets, then bake at 400 degrees for three minutes to brown slightly. Remove from oven and spread pesto on each piece of naan, then top with sliced mozzarella, spinach, and the cooked mushroom/tomato mixture. Bake at 400 degrees for about 17 minutes or until cheese is melted and bubbling, switching trays between oven racks halfway through. Slice and serve hot. Note: I cooked my naan pizzas for 20 minutes and you can see that they got slightly over-browned, so I’d go a few minutes less next time. Pesto Pizza Packs a Punch! You don't need a lot of seasoning here because the garlicky pesto stars in this vegetarian naan pizza recipe -- while the roasted tomatoes provide a somewhat sweeter counterpoint. Serve the rest of your bag of spinach as a side salad and you have yourself a complete easy weeknight dinner, on the table in under 40 minutes. Place naan on two baking sheets, then bake at 400 degrees for three minutes to brown slightly. 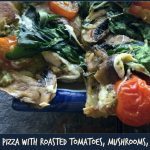 Remove from oven and spread pesto on each piece of naan, then top with sliced mozzarella, spinach, and the cooked mushroom/tomato mixture. Bake at 400 degrees for about 17 minutes or until cheese is melted and bubbling, switching trays between oven racks halfway through. Slice and serve hot. I cooked my naan pizzas for 20 minutes and you can see that they got slightly over-browned, so I'd go a few minutes less next time. We loved these! Thanks so much!!! 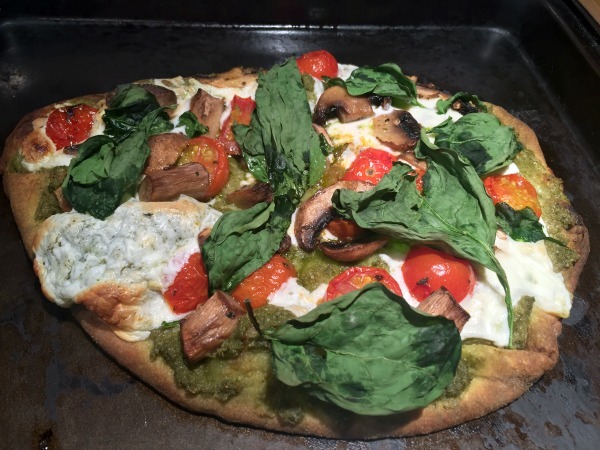 I made the Naan Pesto Pizzas earlier this evening – they were fantastic!! My husband loved them, too! They were better than a gourmet pizza at a fancy restaurant. I had mine with a spinach/garden salad with Aldi’s organic Asian Ginger Dressing and a few tortilla strips, and a small glass of red wine (from Aldi of course). I felt spoiled! Thanks so much! So glad I found your blog on Pinterest.